The Bethany Harty Blog: I Said I'm Done! Lesson learned. 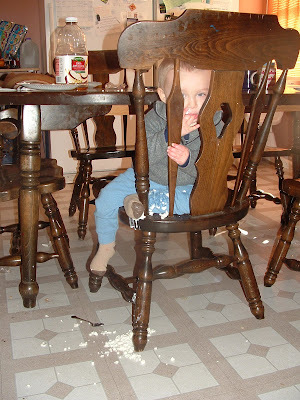 Don't leave the baby at the table with a plate of cottage cheese while you go do something else. At least not this one. He at it so nicely with his spoon and fingers for a while. Then, when he was done, he took the paper plate, and tried to pass it off to someone (?). And paper plates do what they do best. Fold and fall. So the cottage cheese when all down his leg, food, chair, chair leg, and floor. Nice.